Central European Time (CET), used in most parts of Europe and a few North African countries, is a standard time which is 1 hour ahead of Coordinated Universal Time (UTC). The time offset from UTC can be written as UTC+01:00. The same standard time, UTC+01:00, is also known as Middle European Time (MET, German: MEZ) and under other names like Berlin Time, Warsaw Time and Romance Standard Time (RST), Paris Time or Rome Time. As of 2011, all member states of the European Union observe summer time; those that during the winter use CET use Central European Summer Time (CEST) (or: UTC+02:00, daylight saving time) in summer (from last Sunday of March to last Sunday of October). 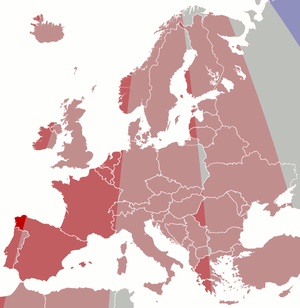 A number of African countries use UTC+01:00 all year long, where it is called West Africa Time (WAT), although Algeria, Morocco, and Tunisia also use the term Central European Time. 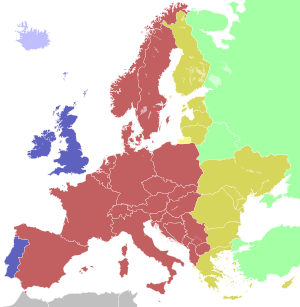 Central European Time is currently (updated 2017) used in Albania, Andorra, Austria, Belgium, Bosnia and Herzegovina, Croatia, Czech Republic, Denmark, France, Germany, Hungary, Italy, Kosovo, Liechtenstein, Luxembourg, North Macedonia, Malta, Monaco, Montenegro, Netherlands, Norway, Poland, San Marino, Serbia, Slovakia, Slovenia, Spain, Sweden and Switzerland. The areas of current Croatia and Hungary (then part of Austro-Hungarian Empire) start using CET. The areas of current Czech Republic (then part of Austro-Hungarian Empire) start using CET. During World War I CET was implemented in all German-occupied territories. Lithuania adopts CET (but subsequently rescinded in 1940). France, which had adopted Paris time on 14 March 1891 and Greenwich Mean Time on 9 March 1911, was switched to CET. After World War II Monaco, Andorra and Gibraltar implemented CET. The time around the world is based on Universal Coordinated Time (UTC) which is roughly synonymous with Greenwich Mean Time (GMT). From late March to late October, clocks in the United Kingdom are put forward by one hour for British Summer Time (BST). Since 1997, most of the European Union aligned with the British standards for BST. Central European Time is sometimes referred to as continental time in the UK. Several African countries use UTC+01:00 all year long, where it called West Africa Time (WAT), although Algeria, Morocco and Tunisia also use the term Central European Time, despite being located in North Africa. Between 2005 and 2008, Tunisia observed daylight saving time. Libya also used CET during the years 1951–1959, 1982–1989, 1996–1997 and 2012–2013. For other countries see UTC+01:00 and West Africa Time. Historically Gibraltar maintained UTC+01:00 all year until the opening of the land frontier with Spain in 1982 when it followed its neighbour and introduced CEST. The westernmost part of mainland Spain (Galicia, e.g. the city of A Coruña); Cape Finisterre and nearby points in Galicia, at 9°18′ W, are the westernmost places of CET in Spain. Western Morocco including the city of Casablanca, at 7°35′ W. CET usage in Morocco extends as west as 13°10′ W.
The entirety of Western Sahara with its western tip at 17°6′ W and its eastern tip at 8°40′ W.
Spain, except for the westernmost part of the mainland (see above) and the Canary Islands (which are further than 7°30′ W and use UTC+00:00). Most of Algeria including it's capital Algiers. 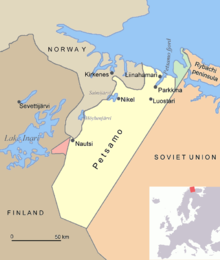 Map of Petsamo area in northern Finland/Soviet Union/Russia. The green area is the Finnish part of the Rybachi peninsula (Kalastajasaarento) which was ceded to the Soviet Union after the Winter War. The Red area is the Jäniskoski-Niskakoski area ceded to the USSR in 1947. The northeast of Norway, lying north of Finland, roughly coinciding with the county of Finnmark. The easternmost town in Norway, Vardø, lies at 30°51′ E, which is so far east, so as to be east even of the central meridian of EET (UTC+02:00), i.e. east of Istanbul and Alexandria. The sun reaches its highest point at 10:56 (when not DST), although the sun does not vary so much in height at the latitude 70°N. The Norwegian–Russian and the Polish-Belarussian border are the only places where CET (UTC+1/+2) borders Moscow time (UTC+03:00), resulting in a two hours time change (or one hour in summer) for the travellers crossing that border. There is a "tri-zone" point (where UTC+01:00, UTC+02:00, and UTC+03:00 meet, winter times) at the Norway–Finland–Russia tripoint near Muotkavaara. During the summer Finland and Russia both have UTC+3. ^ "Europe Starts Daylight Saving on March 27, 2011". www.timeanddate.com. Retrieved 2018-07-19. ^ "WAT – West Africa Time (Time Zone Abbreviation)". www.timeanddate.com. Retrieved 2018-07-19. ^ a b c "Central European Time Zone - CET". WorldTimeServer.com. 2015-11-19. Retrieved 2018-07-19. ^ "Time Zone & Clock Changes in Belgrade, Serbia". www.timeanddate.com. Retrieved 2018-07-19. ^ "Time Zone & Clock Changes in Budapest, Hungary". www.timeanddate.com. Retrieved 2018-07-19. ^ "Daylight Saving Time Changes 1891 in Prague, Czech Republic". www.timeanddate.com. Retrieved 2018-07-19. ^ Bartky, Ian R. (2007). One Time Fits All: The Campaigns for Global Uniformity. Stanford University Press. pp. 126–7. ISBN 0804756422. Retrieved 18 August 2015. ^ "Time Zone & Clock Changes in Rome, Italy". www.timeanddate.com. Retrieved 2018-07-19. ^ "Time Zone & Clock Changes in Valletta, Malta". www.timeanddate.com. Retrieved 2018-07-19. ^ "Time Zone & Clock Changes in Vienna, Vienna, Austria". www.timeanddate.com. Retrieved 2018-07-19. ^ Messerli, Jakob. "Zeitsysteme". HLS-DHS-DSS.CH (in German). Retrieved 2018-07-19. ^ "dullophob". www.dullophob.com. Retrieved 2018-07-19. ^ "Time Zone & Clock Changes in Copenhagen, Denmark". www.timeanddate.com. Retrieved 2018-07-19. ^ "Daylight Saving Time Changes 1895 in Oslo, Norway". www.timeanddate.com. Retrieved 2018-07-19. ^ "Time Zone & Clock Changes in Stockholm, Sweden". www.timeanddate.com. Retrieved 2018-07-19. ^ "Daylight Saving Time Changes 1904 in Luxembourg, Luxembourg". www.timeanddate.com. Retrieved 2018-07-20. ^ "Daylight Saving Time Changes 1918 in Luxembourg, Luxembourg". www.timeanddate.com. Retrieved 2018-07-20. ^ "Time Zone & Clock Changes in Tirana, Albania". www.timeanddate.com. Retrieved 2018-07-20. ^ a b c d "CET - Central European Time". www.thetimenow.com. Retrieved 2018-07-20. ^ "Time Zone & Clock Changes in Vilnius, Lithuania". www.timeanddate.com. Retrieved 2018-07-20. ^ "Time Changes in Poland 2017". www.vercalendario.info. Retrieved 2018-07-20. ^ Bartky, Ian R. (2007). One Time Fits All: The Campaigns for Global Uniformity. Stanford University Press. pp. 130, 134. ISBN 0804756422. Retrieved 18 August 2015. ^ "Daylight Saving Time Changes 2005 in Tunis, Tunisia". www.timeanddate.com. Retrieved 2018-07-20. ^ Purdy, Chase. "Spain spent the last 76 years in the wrong time zone—and it's not healthy for workers". Quartz. Retrieved 2018-07-20. ^ a b "Greece Time Zone". www.timetemperature.com. Retrieved 2018-07-20. ^ a b "Europe Time Zones Map With Zone - madriver.me". madriver.me. Retrieved 2018-07-20.